Two second year optometry students have been awarded the prestigious Vision Aid Overseas (VAO) Irvine Aitchison Memorial Fund bursary to travel with Vision Aid Overseas to Africa. 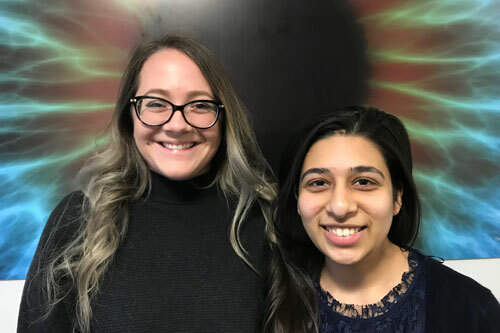 Awarded to Michelle Wright and Huma Batha, the students join a long line of winners from City, as since 2010 students in the Division of Optometry and Visual Science at City has been the recipient of nine awards. The Irvine Aitchison Memorial Fund (IAMF) is a charity that was established in 1966 in memory of Irvine Aitchison. In view of Irvine’s special interest in education, the IAMF has focused on providing opportunities for students of optometry and dispensing optics to broaden their horizons and gain new insights into their professions. The awards are incredibly competitive, as usually only two awards are made nationally. The IAMF provides bursaries for second year students on optometry or dispensing optics course to work with Vision Aid Overseas on one of their overseas assignments. Michelle Wright said: “I'm very excited to have the chance to take part in this VAO mission in Africa. I wholeheartedly believe this will be a learning experience of a lifetime as I will gain valuable life knowledge and irreplaceable fieldwork experience. I'm excited to help in a division in which I am passionate and can continue to expand my knowledge from my experienced team members." Huma Batha said: “I’m thrilled to have been selected for this bursary which will allow me to travel with Vision Aid Overseas during the summer. I am excited to start applying the skills gained on this course to aid those who may not get another opportunity to receive the help they need. I look forward to gaining a wealth of new knowledge and furthering my practical experience."